There are certain things that a person looks forward to for their entire life and as the event approaches they worry that it will never match their long held expectations. This was how I felt about my visit and tour of Lord’s. Fortunately, despite my concerns, the grand old cricket ground didn’t disappoint. Any tour can only be as good as the guide, their material and the place of interest. In each of these three areas the Lord’s Tour was exceptional. I attended on a Wednesday and for that particular day of the week the tour guide was Irving Bernard. He displayed a remarkable knowledge of the stadium and its history. With centuries of games, players, events and characters there was no shortage of raw information for Bernard to draw upon, but his real talent shone through in the way he regaled the tour group. His enthusiasm was addictive and each snippet of information was delivered with a passion and reverence that had all members of the group hanging on his every word. The tour begins at the MCC Museum. The museum lays claim to being the world’s oldest sporting museum and contains a wonderful and rare collection of cricketana. 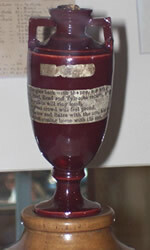 Items range from WG Grace memorabilia to 21st century bats used in recent matches to the jewel in the crown, the Ashes Urn. In addition to the regular display items there is also currently ‘The Brian Lara Exhibition’. This is a look at Lara, both on and off the field, and provides a vivid contrast to many of the ancient and aged items found elsewhere in the museum. After leaving the museum the tour concentrates on the grounds at Lord’s. Only by walking around the stadium can its beauty and interesting quirks be fully appreciated. There are numerous small gardens that are beautifully manicured and tended but serve little practical purpose at a cricket ground, there is a ‘real tennis’ court that has a thriving membership and players even compete during Test matches and there is only a moderately low perimeter wall that separates the stadium from the back gardens of neighbouring houses. Lord’s has a charm and character that elevates it above and beyond the design and demands of a regular sports stadium. There is a real sense that this ground has a higher purpose than just hosting cricket games. Moving into the Pavilion, the real history of Lord’s begins to overwhelm the visitor. Built in 1890, and now surrounded by far more recently constructed stands and opposed by the ultra-modern Investec Media Centre, the Lord’s pavilion contains a treasure trove of art history and institutional memories. An interesting thread is that each room contains paintings and art work based around a specific theme. The Long Room has art work from the early days of cricket, the committee room has paintings related to the games administrators, and the bar contains wonderful portraits of 20th century players. The tour continues around the pavilion, up the stairs and into the home dressing room. Further nuances of Lord’s are revealed, as the famous balcony is shown to be tiny with room for no more than a couple of people to stand, and that there are no showers in the dressing rooms and players have to walk across a public hallway to gain access. It is also in the dressing rooms where the biggest disappointment of the entire tour awaits. This is the legendary honour boards where batting and bowling successes are recorded for future generations to marvel at. However, the honour boards look like cheap 1970’s plywood wall panels with low grade transfer lettering, a big let down. However, that feeling of disappointment is soon forgotten as the guide continues with the tour and where you can relax and visualise historical events and feats as he describes them. One such example is Albert Trott hitting the ball over the pavilion whilst playing for the MCC against the Australians in 1899. This was a truly mighty strike that has never since been replicated in well over 100 years despite advances in bat technology. The tour ends at the Investec Media Centre. It really is a fitting close that brings the tour party member from the early origins of the game to the 21st century. All told, the tour takes approximately two hours and the surroundings, history and guide make this a memorable, entertaining and informative day out. Admission for adults is 12 GBP though concessions and offers are available so it is wise to scout around before going. I had a chance to do a tour of Lords. I thought it was awesome, and I didn’t get a chance to take in the long room as it was in use at the time. I was a bit miffed by the restrictions placed on photography. Where are the Black Batsmen?